(Ajuga, Bugle, or Bugleweed (Ajuga reptans) - 01) Ajuga is most often found growing along roadsides and in fields, and is often used as a ground cover in domestic gardens. 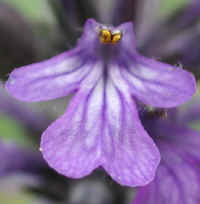 Ajuga or Bugle are a native of Europe, and a member of the Mint family (Lamiaceae). 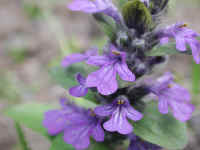 There is another member of the mint family, Lycopus virginicus, which is also called bugleweed, but this flower is white and grows in clusters around the leaf axils. 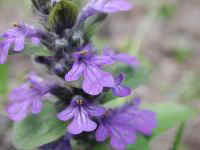 (Ajuga, Bugle, or Bugleweed (Ajuga reptans) - 01a) The tubular shape of the one-half inch long flower of the ajuga, which is somewhat bugle shaped, has led to the common name of this flower. In this close-up photo, we can also see some of the white hairs that grow on the underside of the flower petals and leaves. (Ajuga, Bugle, or Bugleweed (Ajuga reptans) - 02) This ajuga was growing up through the stone along the side of the road. If undisturbed, they can grow to heights of 4 to 8 inches. The larger lower leaves have rounded toothed edge, unlike the upper leaves that are smooth edged. 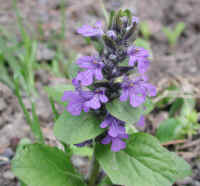 We have also noticed that some ajuga plant leaves of more glossy. Ajuga bloom from May to July. (Ajuga, Bugle, or Bugleweed (Ajuga reptans) - 03) In this photo of the ajuga, we can see that the upper leaves are somewhat darker and glossier than those in the previous photo. 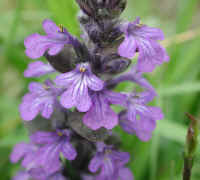 Some of the flowers on this plant also have a light blue blush on the petals. (Ajuga, Bugle, or Bugleweed (Ajuga reptans) - 03a) In this side view of an ajuga flower, we can see more of the bugle shape. the pistil and the stamens. 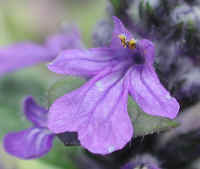 We have not been able to find any really complete descriptions of ajuga in the literature, and have not been able to determine the exact number of stamens. 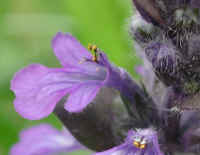 (Ajuga, Bugle, or Bugleweed (Ajuga reptans) - 04) This is a bee's eye view of one of the ajuga flowers.